It is pretty inevitable that the launch of a new range of make-up by one of the most popular shops in the UK is going to generate a huge amount of interest in the blog-world. So here are my two cents about it. I made a trip to the Oxford Street branch, which does have quite a substantial area dedicated to the make-up range that was well stocked (even at the end of a busy Saturday). The core collection was stocked around the walls and stands in the middle with the LE/seasonal products. I wasn’t really grabbed by any of the LE stuff as I thought the colours are a bit more Autumn/Winter than Spring/Summer, but the standard collection looked pretty good. I have mixed views about the packaging, I don’t think it’s anything amazingly special – but I do like how sturdy the pot for the lip polish is, and how it includes a (very small) mirror. Quite handy. Price wise, I think they are all reasonable with the cream blush being in my eyes, the best value product. I have a bit of a thing about blushers at the moment, I really think a touch of blusher can do wonders in lifting the face – the right colour can be so flattering. The Neon Rose blush is a little intimidating in the pan as the colour is very bright, but having had a play with the tester I found that it blends so smoothly into a pretty sheer coral shade. I need to give this a proper test and see how it lasts through a work day, I have a feeling it might slide off a little too easily…. but we will see. I bought the lip polish without playing with the tester – but when I did give it a swatch at home, I was really impressed how pigmented it is – especially for a balm. It’s a lovely bright colour on the lips, but I’m afraid I don’t have a good picture as my lips are quite chapped at the moment so I will save you all from having to witness that. Although – after wearing it on my lips I do feel they are softer than before, so that’s a good thing! I haven’t tried the nail varnish yet, it’s a pretty greige that I am a sucker for so will report back once I have tried it out. All bought by myself. I think I need to stop before I bankrupt myself. Is the balm moisturising or does it really only add colour? I love pigmented balms! 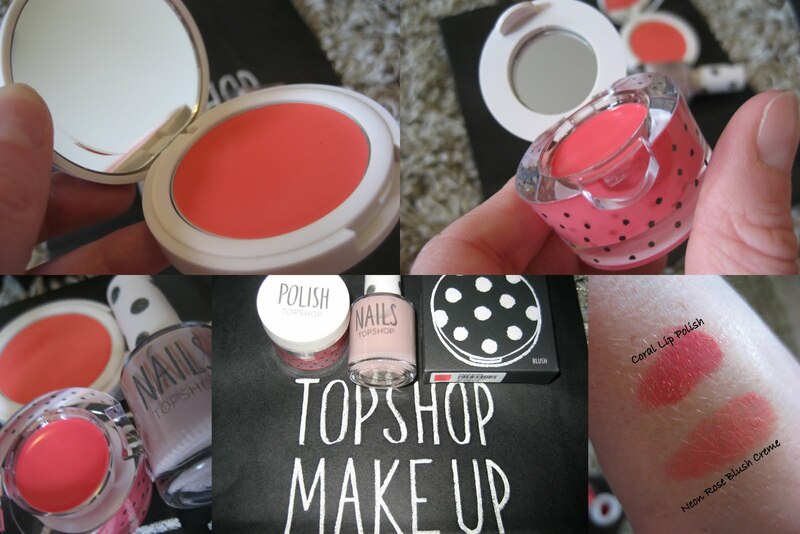 Must get some Topshop make up as soon as poss. Heard so many good things about it. I like all these posts about Topshop makeup. My local Topshop only stocks a few pieces so it’s helpful seeing all these posts so I can purchase a few bits online. Even though the blushes look so pretty I will wait till my next trip into London as I have too much blush! I really like your little disclaimer lines, they are quite funny. Must admit nothing grabbed me in their collection. All colours ive seen before, which is what normally attracts me to buy something. I don’t think it claims to moisturise, but I think it did – my lips definitely felt softer after wearing it. I’m really loving the blusher – been wearing it all week now and it goes on so smooth, blends and lasts. What more could I want!